The Liberal Democrat leader was appearing on the BBC’s flagship debate programme in Dewsbury, West Yorkshire. He added: “I take the view that the position has changed enormously since the referendum took place. “A lot of people are changing their views about it. 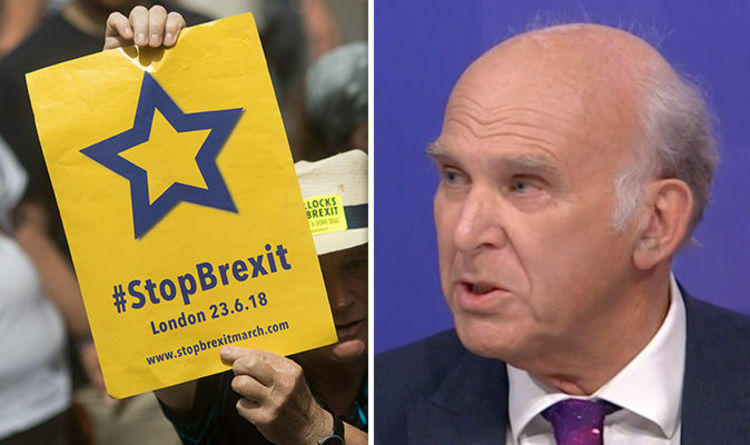 Mr Cable claimed public opinion was “very clearly swinging in favour of having a people’s vote”. The MP went on to suggest there was “very clear evidence” that the public was “re-thinking the merits of leaving”. But his comments were quickly shut down by journalist Camilla Tominey. She said: “There isn’t any evidence for that, Vince, I’m sorry. She added: “I don’t know of any leave voters who – despite everything that has been said and project fear – are running around screaming going, ‘oh my God, oh my God, I have made a terrible mistake’. “People knew that they wanted to leave the single market and the customs union. “They wanted to completely sever ties with the EU. The Prime Minister has spent the last few days at an EU summit in Salzburg, where she has tried in vain to sell her notorious Chequers plans to senior EU officials. But she was given curt treatment from President of the European Council, Donald Tusk, who said Mrs May’s plans undermined the single market and were, therefore, a red line for the EU. EU bosses cannot accept Mrs May’s Brexit proposals because, in their eyes, they involve “cherry picking” the best elements of the single market to suit the UK. Mr Tusk revealed his views in a flippant Instagram post of him and Mrs May stood next to a cake stand.